As China rolls out seven domestic pilot emissions trading schemes this year – with the city of Shenzhen’s debuting last month – market actors are wondering how carbon offsets will fit into the picture. Here, we provide a breakdown of the types of offsets eligible for trading, existing supply and potential demand, as well as what’s on the horizon. 9 July 2013 | Designated as China’s first special economic zone back in 1980, the fast-growing city of Shenzhen has come to epitomize the country’s move toward market-oriented economic policies. On June 18, Shenzhen set yet another precedent when it launched the first of seven pilot programs to help pave the way for a national cap-and-trade program. 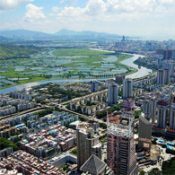 Under the pilot program, 635 companies in Shenzhen, responsible for about 38% of the city’s emissions, face obligations to reduce their carbon intensity by 6.68% on average per year by 2015. The first day of trading on the Shenzhen Emissions Rights Exchange saw eight transactions of emissions allowances completed for a total of 21,112 tCO2e. Allowance prices ranged from 28 to 32 yuan per tonne, close to the expected price of 30 yuan per tonne (US$4.89). While only allowances have been traded so far, emitters have the option of trading carbon offsets in the form of Chinese Certified Emission Reductions (CCERs), which are issued by the National Development and Reform Commission (NDRC). The NDRC allows existing projects registered with the UN’s Clean Development Mechanism (CDM) to register as CCER projects – a source of potential relief for CDM suppliers reeling from the protracted collapse in prices for CDM project offsets (CERs) and the recent ban on CERs from non-least developed countries for use in the European Union Emissions Trading Scheme (EU ETS). Beyond the historically strong relationship between suppliers of Chinese renewable energy offsets and European buyers, there is potential for CERs from China-based projects to fetch higher prices from domestic buyers should the pilots manage their prices well. With more than 70% of the world’s CERs issued in China as of the end of 2012, a big question on the minds of Chinese CER suppliers is how much domestic demand they can actually expect to absorb existing and new offset supply. Initial reactions to China’s new pilot activities have generally been positive among stakeholders, but elements of the system remain hazy. Liable emitters are expected to not only monitor, report, and verify their emissions, but also to participate in auctions. For the bulk of Chinese companies, trading offsets – or allowances for that matter – is an unfamiliar arena. In March, the NDRC released its first batch of 52 CCER methodologies eligible for domestic emissions trading, all of which are adapted from existing CDM methodologies. The list stays true to China’s traditional focus on renewable energy, energy efficiency and fuel switch, and methane. It also controversially includes methodologies for HFC-23 and N2O industrial gas offsets, which the EU ETS banned post-2012 in response to critique regarding their environmental integrity. Some say it is important for industrial gas suppliers to be able to access the domestic market – now their only major prospective source of demand – for recourse, however, a recent analysis by Climate Bridge – a major China-based project developer and wholesaler – expresses concern that the inclusion of industrial gas projects could crowd out China’s domestic offset market and potentially subject pilot schemes to low carbon prices as experienced in the EU ETS. Offsets from non- or pre-CDM projects are eligible for voluntary emissions trading if they apply methodologies that have been approved by the NDRC, according to interim government regulations. While not explicitly stated, this could potentially provide a bridge for projects developed to the Verified Carbon Standard (VCS) and Gold Standard, which certify many of their projects according to CDM methodologies. NDRC-approved methodologies do not yet cover forestry and land use, which the NDRC said it is still vetting alongside other CDM methodologies. Domestic initiatives like the Panda Standard, China’s first voluntary carbon standard developed by the China Beijing Environment Exchange and BlueNext with the support of Winrock International, are in the process of seeking approval from the NDRC for afforestation/reforestation methodologies. Domestic demand for offsets will inevitably vary between Shenzhen and other emerging pilots. After factoring in the level of emission reduction targets and allowances provided through the system (totaling 100 MtCO2e between 2013-2015 for Shenzhen alone), the scope of supply and demand for offsets will depend on the existing supply of offsets eligible for use under each pilot, as well as limits set on the use of offsets against emitters’ compliance obligations (tentatively 10% on average across China’s various planned pilots). Given China’s large existing offset supply in certain areas, many project developers have been slow to embark on new projects until sufficient demand can soak up existing inventories. Climate Bridge’s analysis predicts that Shenzhen will have limited potential for new offset project development, as “the existing CER supply in this region already makes up more than 8% of the capped emissions.” The company expects other pilot jurisdictions like Tianjin, on the other hand, to have strong demand for new CCERs given the dearth of existing CDM projects in the area. Greater demand (and clarity) ahead? Over the course of this year, other pilots are busy incubating in the cities of Beijing, Tianjin, Shanghai, Chongqing, and the provinces of Hubei and Guangdong – each setting their own limits on offset location and project type. The plan is to eventually link the schemes together as a foundation for a national cap-and-trade program as early as 2016, following the release of China’s next Five-Year Plan. Should China’s carbon market eventually link with other markets abroad, China would be a net exporter of offsets, at least for the foreseeable future. The probability of cross-border linkages is still pretty slim at this point according to Wenjie Zhuang, Senior Project Manager at Climate Bridge. Daphne Yin is the Voluntary Carbon Associate in Ecosystem Marketplace’s Carbon Program. She can be reached at dyin@ecosystemmarketplace.com.